One of the difficulties with organizations today is to represent them in an acceptable way. The old organization chart is largely outdated since it shows only the hierarchical dependencies and not the reality of the corporation. But what is the reality? How could one represent an organization in a way useful to employees, clients, shareholders and other stakeholders? The difficulty stems from the very belief that one representation would be enough. An organization is a multidimensional geography and should therefore be represented in multiple ways depending on what one wants to show, like geographic maps do. The analogy is striking. The geographical maps that where hanging in the past in classrooms, or that can be found today on the Internet, can relate to the physical dimension (mountains, valleys, seas and lakes, rivers, etc. ), the political definitions (official limits of countries as claimed by them), the administrative organization (cities with their relative administrative importance, provinces, states), the cultural dimension (languages used, religion practiced), the ethnographic realities (ethnies, tribes, communities around the notion of nations, etc. ), the economic system of wealth generation (nature of industries, mines, agricultural productions, etc. ), the state of infrastructure (cities according to their size, roads, airports, highways, trains, but also electric lines, high speed internet diffusion, mobile telephony access, digital TV access, etc. ), and more. 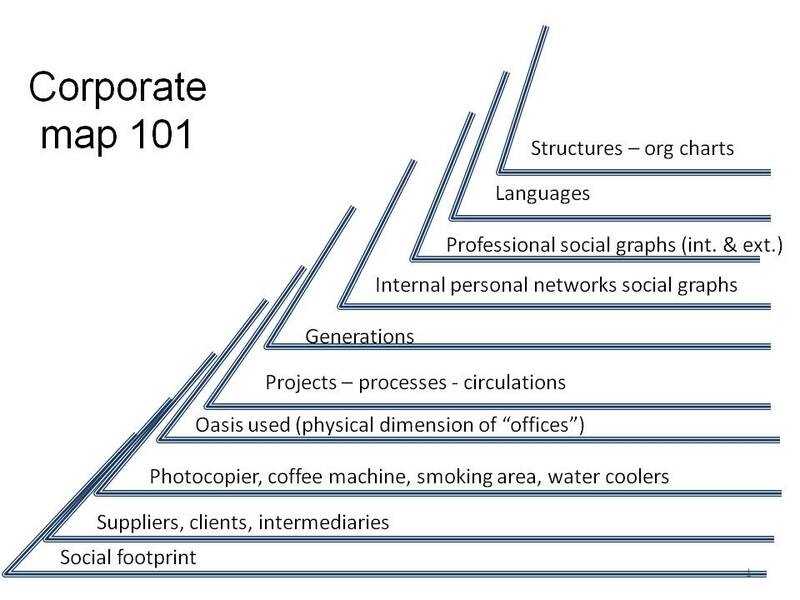 These dimensions have been well explored in the geographic world and, surprisingly, are not common for corporations although they are, they should be, as important for them. Today it is as if only the administrative map (the hierarchy of Business Units and of sub business units within a classic organization chart) would be the only one map worth hanging on the wall! What a loss of information in this so-called information age. The importance of charting new maps is not only for taking into account the “new” dimensions of collaboration into corporations (the so-called 2.0 factor) but also, and more crucially, for better reflecting their human and social dimension. Lets just reflect a minute on some maps that could be used to represent a corporation and their respective usages (the discussion is open to add to this very tentative list). And let’s look at them as layers that could be mashed up or used separately depending on the usage. In such a picture the old “org chart” is still here but looks really poor. The languages map is becoming particularly relevant whenever a multinational would like to create global teams, not only because of the languages used at geographical locations but also and mostly because of the need to know which languages are available all over the firm. The generations map showing where the corporate demographics stand, where the retirement wave could soon lead to knowledge loss or where the greenhouse for young talents could be. The “informal” gathering places. This map should show the location of photocopiers, coffee machines, water-coolers, cafeterias, smoking areas, etc. It would take its maximum value as mashed up with the physical map of the offices since it would highlight where some of the most important informal activities do happen and could even lead to cultural analysis (a “sad” coffee machine area in the middle of one business unit has a very different impact on internal culture than a “cozy” coffee machine corner located at the crossroad of corridors leading to different business units). Some people have started to join their colleagues at smoking places, even if they are non-smokers, just because it is a place to be for chats. The suppliers, clients, intermediaries’ maps showing who is in relation to whom from the outside world. It is surprising to discover how many business partners do actually interact with one company at several touch points without these touch points talking to each other. In many cases this can even lead today to the absurd situation where a supplier suggests to one of his contact to get in touch with an other one within the corporation! The social footprint map. This one is probably the most ignored today and the most important for the 21st century from a world of work perspective. It would describe the social footprint a corporation has on its broader social environment: how many people work directly for her, how many live, or depend indirectly, out of her activity, how many individuals can benefit from her activity e.g. thanks to the corporate social responsibility actions or from educational or training impact, etc. This is too big a chart for this post but a major one to come. Those maps are not yet all conceptualized, far from it, and most of the instruments to map them do not exist yet. So what? The first cartographers of the physical world gave us very sketchy and imperfect maps of the world, but without them no progress could have been made. Let’s hope that a large corporation will soon launch a crowd sourcing project on the best ways to represent all these maps (and others). I like very much the idea of drafting new representation of an organisation to envision new challenges. Instead of being live buried under too many hierarchical levels, one might find, with an appropriate chart, a smarter route to optimize his own contribution to the group performance. Among the proposed charts, the best one by far from my perspective is the one drawn by customers, suppliers and all others stakeholders. If someone could find an adequate representation of it, it will for sure boost our companies and terminate the current deadly crisis period !